For pickling cucumbers the old-fashioned way for extra crispness and flavor! 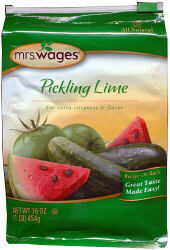 Makes Cucumber Lime Pickles (recipe on bottle), Green Tomato Pickles, Watermelon Rinds and Citron Pickles. Please note: You will receive either the 16oz bag or 16oz can depending on in-house stock.